In move that was widely anticipated by most market experts, the Federal Reserve on Wednesday elected to keep rates unchanged, holding its policy rate in a range between 2.25 percent and 2.5 percent. The capital markets initially expected rates to remain steady after the central bank spoke in more dovish tones following the fourth and final rate hike for 2018 last December. Prior to the announcement, the CME Group’s FedWatch Tool was expecting a 98.7 percent chance that rates would remain steady. “Patience” has been a mainstay in Fedspeak since the December rate hike and again in January when the central bank elected to keep the federal funds rate unchanged, saying that it will be patient moving forward with respect to further rate adjustments. Moreover, the Fed has also been saying that it will be mostly data-dependent and have more flexibility when it comes to interest rate policy decision-making. The market sell-offs during the fourth quarter of 2018 also gave the Fed more pause with respect to rate hikes. 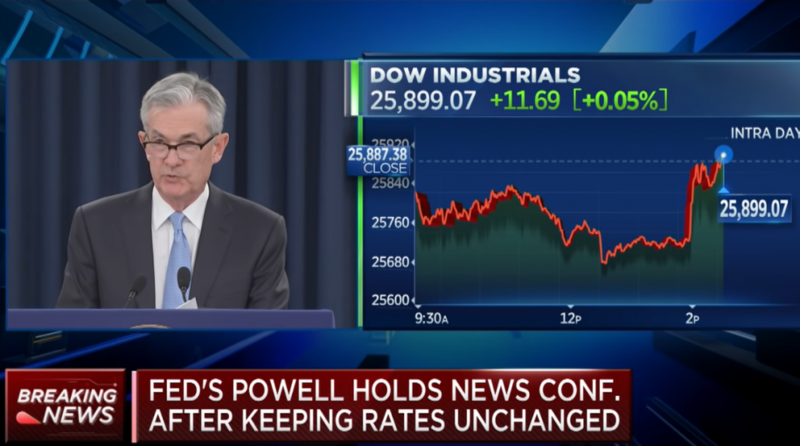 During Federal Reserve Chairman Jerome Powell’s semiannual testimony before Congress last month, he mentioned that “crosscurrents and conflicting signals” are warranting a patient approach with respect to interest rate policy.